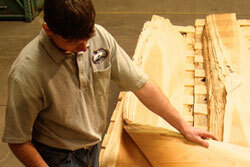 Veneer is cut from trees that are straight and without defect. These trees are first cut into logs. Then they are kept wet and cool to prevent the ends from splitting and discoloring. 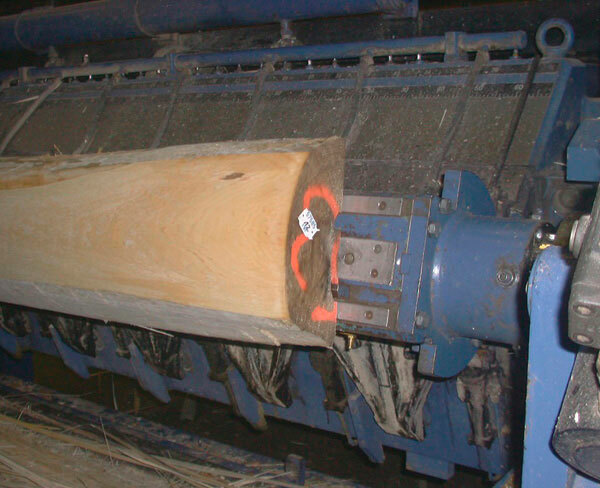 Prior to further processing, the log ends are cut off to expose fresh wood. After the log's ends are trimmed, the bark is removed. 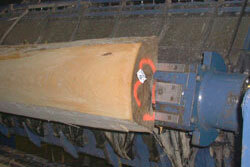 This reveals additional characteristics and helps determine the position from which to cut the log. 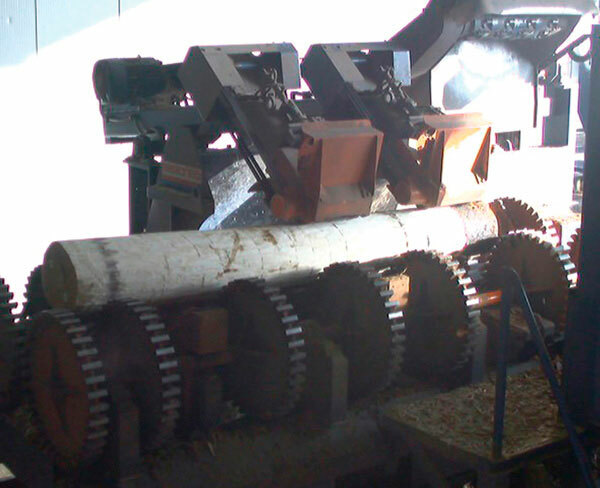 Unless the log will be rotary sliced, it is cut lengthwise into halves or quarters. 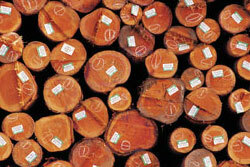 Each section of the log is called a flitch. To successfully slice the flitch into veneer it must be saturated with water. This is done by submerging the flitches in water tanks. 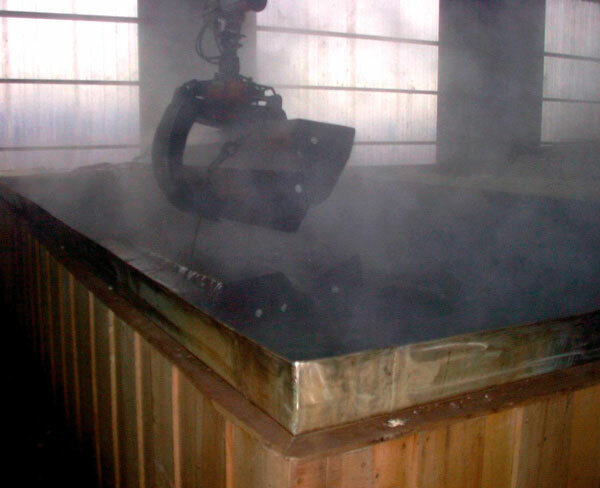 The saturation process is accelerated by gradually heating the water to approximately 170°F. The flitches remain at this temperature for 1 to 5 days, depending on the desired color and time required to reach 100% moisture saturation. The longer the flitch is cooked, the darker it becomes. 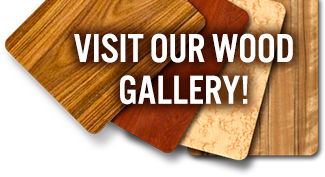 Light colored woods such as Maple, Ash, Beech and Birch are usually cooked less to minimize discoloration. 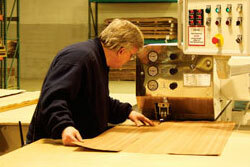 If the flitch is not cooked long enough, the veneer will be rough and experience grain tear during the slicing process. After cooling, the flitch is secured to a vertical support on a slicer called a “stay.” The flitch moves up and down at a rate of 40-100 cycles per minute. 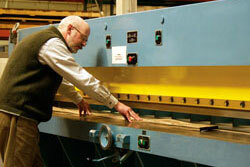 After each cycle a 16’ long knife advances toward the flitch at a preset increment ranging from 1/8” to 1/64”. As the knife advances towards the flitch it slices off a thin section of wood called a veneer leaf. The flitch is reviewed to determine the best yield. It is sorted into smaller bundles called “books”. At this point the leaf width is determined by the panel requirements, which can be specified as either running, balanced or center matched. The edges and ends of the book are then clipped to a uniform width in a wide guillotine. The leaves are fed into a veneer splicer which applies glue and forces the edges of the veneer together under heat and pressure. 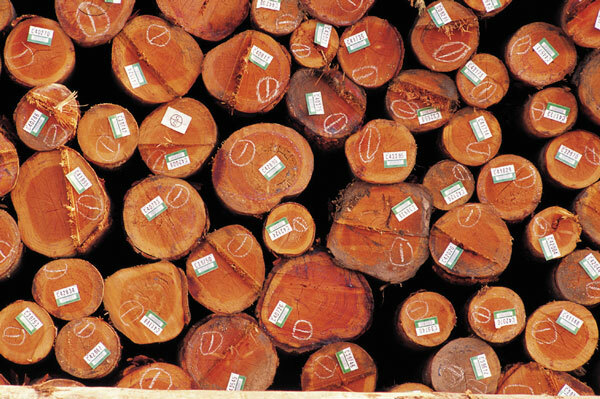 The resulting splice line is stronger than the wood. 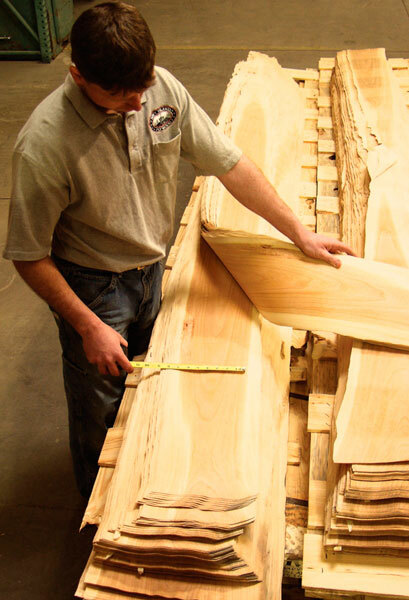 Splicing the individual leaves together forms a veneer face. The face is then inspected over a light table. The light reveals characteristics not visible under normal lighting conditions. Defects or cracks are taped and repaired. 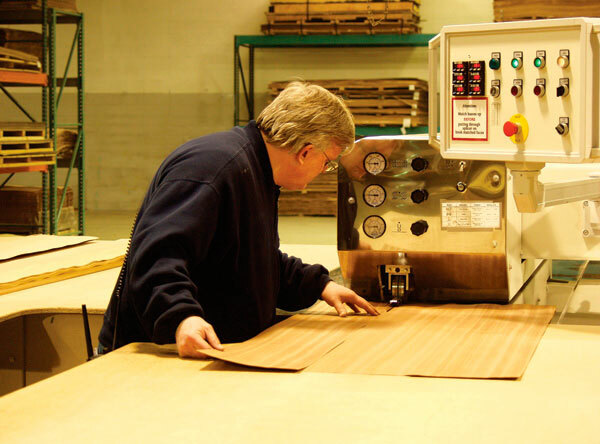 Each panel requires a front and back veneer face. The faces are then sent to a large press. 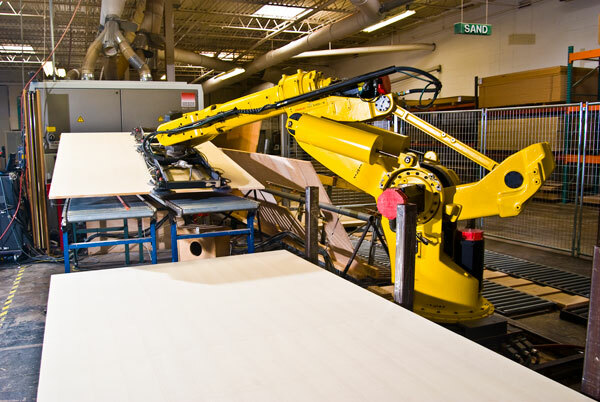 The core for the job is loaded at the front of the press and the front and back veneer stacks are loaded downstream into separate trays over the lay-up conveyor. 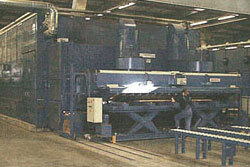 To make a panel, the operator places the back face on the lay-up conveyor. One core sheet is then automatically fed through a panel cleaner and a glue applicator. The glue applicator applies a precise layer of waterproof adhesive to both sides. 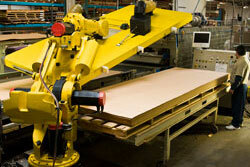 Rollers then transport the panel to the lay-up conveyor and lower the core on the back face. 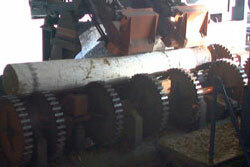 The operator then places and aligns the front face. It is now conveyed into the press. 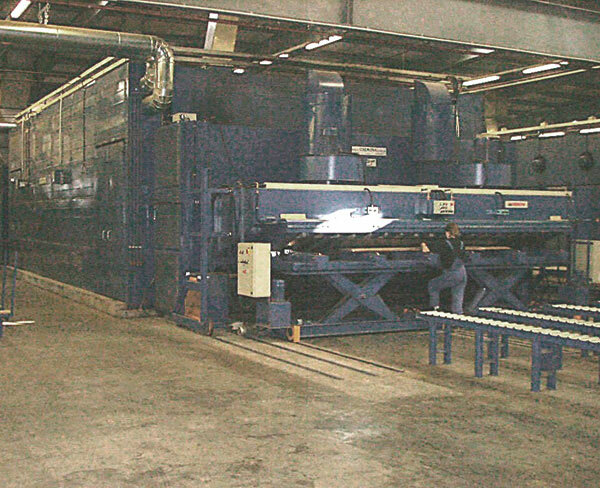 The press closes and applies 700 tons of pressure at about 300°F for approximately one minute. The combination of heat and pressure cures the adhesive, permanently bonding the veneer to the core. 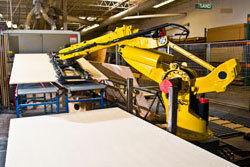 Panels that do not need to be cut to size are trimmed of the excess veneer. 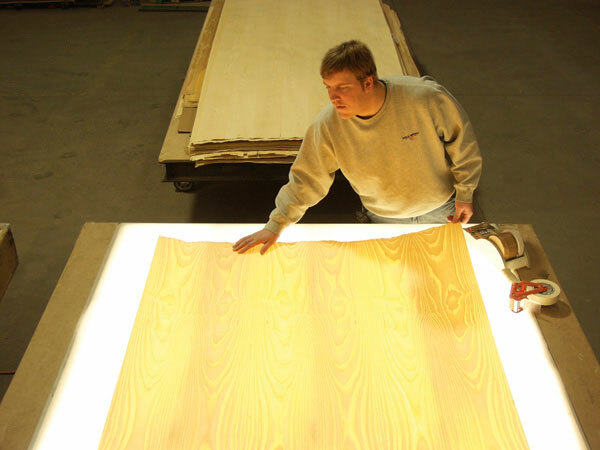 Panels that need to be cut to size are brought to a panel saw. Finally, the panels are sanded. 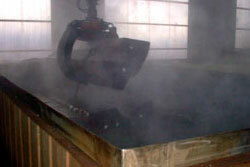 Panels with the grain running in the long dimension are fed though an in-line sander. 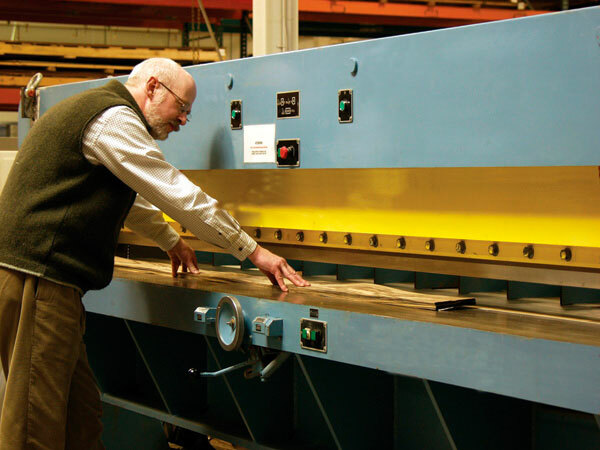 Panels with the grain running across the short dimension are fed through a cross-belt sander. 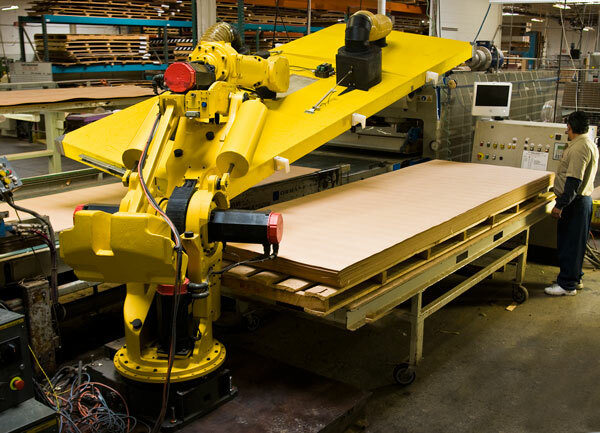 These sanders remove tape and produce a uniform surface on the plywood. 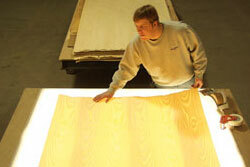 After sanding, the panels are inspected one final time before being packaged and shipped to the customer.